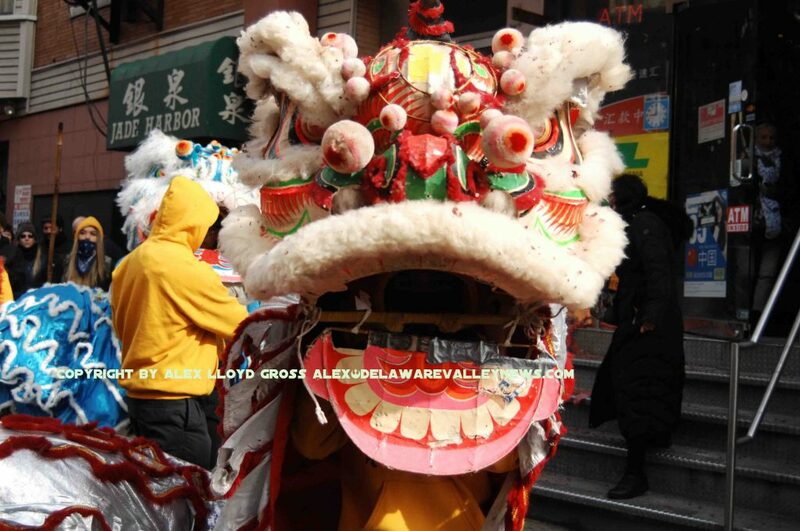 Alex Lloyd Gross Photo- Delaware Valley News.com A lion does his thing in Chinatown. 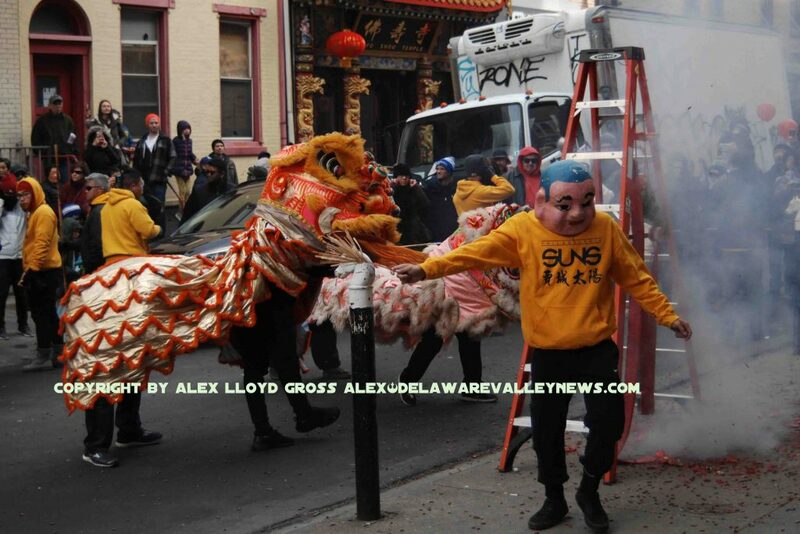 Alex Lloyd Gross- Photo- Delaware Valley News.com An evil chaser leads a lion around exploding firecrackers. In Chinatown today, ( February 10, 2019) huge crowds gathered. Fire crackers explodes and traffic was detoured. It was the annual celebration of the Chinese New Year. Every year, paper mache lions ( with humans inside) made their way down the narrow streets. This event is put on the the Philadelphia Suns, a local Kung Fu club. The idea behind this is that merchants will agree to make a donation to the Chinese Benevolent Association in exchange for the lion to make a stop at their establishment. When the lions pay their visit, members of the Suns bang on a large kettle drum, as the lions parade down the streets. Large strings of firecrackers are put up, and two evil chasers, dressed in pig masks, dance around the exploding firecrackers, with the lions. The evil chasers are exactly that, they are supposed to ward off evil spirits for the upcoming year. After the string of firecrackers has finished, the lions will be fed lettuce. Then comes a red envelope with money inside, which is put into the mouth of one of the lions. This tradition has marched in Philadelphia for at least 40 years. It is very loud. Most of the members of the Sons that participate in this wear ear protection. It is a photographers paradise. Even if you cannot take good photos, you will get awesome pictures. Photographers were spotted using old film cameras as well as new digital cameras. Cell phones were ubiquitous , with the curious straining to get video to show their friends or to post on social media.